Good news for all those job seekers those who were in search of Government Vacancies in Haryana State. Haryana going to recruit Large Number of Posts of through Haryana Staff Selection Commission (HSSC) in the year 2015. 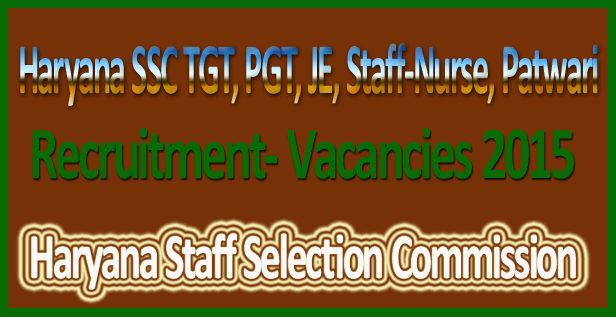 Online Apply for the TGT & PGT Vacancies for HSSC Recruitment 2015 So, hurry up & apply now online. Candidates those who were in search of Government Vacancies in the Haryana State 2015 now all of them had the very great news that they can start applying online for HSSC TGT, PGT, JE, Staff-Nurse, Patwari Posts online because here we are going to provide you direct link where you all interested & Eligible candidates can start Applying Online application form for HSSC TGT, PGT, JE, Staff Nurse and Patwari Recruitment Vacancies 2015. HSSC is going to recruit total number of HSSC TGT 1919 Posts Recruitment Vacancies 2015. More than Lacs of online Applications Were going to be received for these HSSC TGT Teacher Posts and if you are eligible & Interested for these HSSC TGT Vacancies 2015 then you can start applying online application form for these Posts by following the below Given direct link. Even you will be able to check Eligibility Criteria for the Posts of HSSC TGT Posts Vacancies 2015 i.e. Salary of TGT Vacancies, Education Qualification for TGT Teacher Vacancies etc. 31 Posts of HSSC TGT (Trained Graduate Teacher) Urdu. 34 Posts of HSSC TGT (Trained Graduate Teacher) Music. 72 Posts of HSSC TGT (Trained Graduate Teacher) Home Science. 6 Posts of HSSC TGT (Trained Graduate Teacher) Home Science (MWT). 18 Posts of HSSC TGT (Trained Graduate Teacher) Physical Education (MWT). With over 6874 PGT (Post Graduate Teacher) HSSC Recruitment posts 2015. In TGT Vacancies there would be lots of Competition and large number of online Application Form are going to be filled by the eligible & Interested Candidates and now all those candidates those who are willing to filling online application for HSSC PGT Vacancies 2015 they just need to click on the below given link to fill online application form for HSSC PGT Vacancies 2015. HSSC recently released the teacher’s recruitment notification to fill 6874 PGT Teacher vacancies in the Haryana State 2015. The application forms filling process for Haryana SSC PGT recruitment will start from August 21st 2015. HSSC is providing Very Attractive salary for HSSC PGT Vacancies 2015. So, to know more information related to HSSC PGT Vacancies 2015 you all just need to visit below given link on this page. There were total numbers of 1418 Posts of HSSC JE Recruitment Notification has been issued by the Haryana Staff Selection Commission for the year 2015. Now all those candidates find themselves for the Posts of HSSC JE Recruitment 2015 will be able to fill online application form now Online by clicking on the below given link on this page. Now you just need to know more info related to HSSC PGT Vacancies Posts 2015. Now you can checkout Eligibility Criteria for HSSC Junior Engineer Posts 2015 by following below given link. Haryana Staff Selection Commission had recently issued the Recruitment notification for the HSSC Staff Nurse, MPHW, Radiographer and various Posts. So, online application form for HSSC Paramedical Staff Nurse has been started by the Department so you can start Applying Online Application form for these HSSC Staff Nurse, MPHW, Radiographer Recruitment Vacancies 2015. Now you can Start Applying online for HSSC Paramedical MPHW Staff Nurse Posts & Check Eligibility by clicking on below given link. HR HSSC department had issued the Gram Sachiv-Canal Patwari Recruitment notification and candidates can start applying online Application form for these Posts from September 22nd 2015. There were total number of 1327 posts of Canal Patwari and Gram Sachiv in Haryana State, India. Last date to apply online for eligible & interested Candidates is October 21st 2015. You can start Apply online for HSSC Gram Sachiv, Canal Patwari Recruitment Vacancies 2015 and Check Full eligibility by visiting below given easily link.